John 20:21, A Call to Evangelize? This article is the third and final post concerning what many consider Scriptural calls to evangelism. CNN published an article by Ed Stetzer, a noted evangelical pastor, who asserted that three verses in Scripture–Matthew 28:19, Acts 1:8 and John 20:21–supported the view that Jesus commanded His disciples to evangelize, specifically to invite people to church. We previously explored the context, word meaning and literary structures of Matthew 28:19 and Acts 1:8, concluding that neither were calls for all Christians to evangelize or invite others to Sunday services. We now arrive at John 20:21 which includes the phrase: “As the Father has sent me, I also send you.” Our goal here is the same as before–based on the context, word meaning and literary structure of the passage, is this a call to evangelize? The verse in question, 20:21, belongs to a literary structure that begins, chronologically, in verse 19, “on the evening of the first day of the week,” and ends in verse 26, “after eight days.” According to John, Jesus was crucified on the “day of preparation” for the Sabbath. (John 19:31, 42) The “day of preparation” can also refer to the day prior to the Passover on which the lambs are slain. In John 18, the Jews who brought Jesus to Pontius Pilate did not enter the Praetorium “so that they would not be defiled, but might eat the Passover.” This suggests that the Passover was imminent, possibly that evening, which in the Hebraic reckoning of a day’s beginning was the next day. If this is correct, then the “day of preparation” would have been a Friday during the daylight hours, the Passover on what we consider Friday evening, and as a consequence, the Sabbath and the Passover would have fallen on the same date. A point that intrigues me about the “days” in John 20 is the possibility that they potentially represent the beginning of the Feast of Unleavened Bread (the evening of the first day of the week) and the “morrow” of the Sabbath (the eighth day), described in Scripture in Leviticus 23:15. This eighth day would, according to that same verse, represent the first day of the 50-day count toward the Feast of Shavuot and would always fall on a Sunday, known in the Hebraic world as the first day of the week. Aside from this, verses 19 and 26 are all but identical, repeating the phrases, “the doors were shut,” “stood in their midst,” and “peace be with you.” There’s a very definitive synonymous parallelism here. Line 20b parallels verse 25 in that we have the repeating phrase that the disciples “have seen the Lord.” Importantly, Jesus is in both instances referred to as Lord. This, it seems to me, is purposeful on the part of the author, John, in that the person of Jesus is referred to by His name, Jesus, in other parts of the passage. Before analyzing letter “C” in our literary structure, we need to digress a bit. In verse 21, Jesus states the Father sent Him. A question arises: why did the Father send Jesus? Did Jesus Himself mention why? John 18 provides an insight. In that chapter, Jesus is taken to Pontius Pilate, the Roman governor. There are a couple of patterns in the text that jump out. The setting is the Praetorium, which is Latin for palace. As mentioned earlier, the Jews who brought Jesus to Pilate stayed outside the Praetorium lest they be defiled and unable to eat the Passover. (v. 18:28) Pilate becomes a “moving party”–in verse 18:29, “Pilate went out (exerchomai) to them (the Jews) and said ‘What accusation do you bring against this man? '” In verse 18:33, Pilate goes in (eiserchomai) to the Praetorium where he converses with Jesus. Then, in line 38b, Pilate again “goes out” (exerchomai) to the Jews. Out–in–out. In all this time, where is Jesus? In the Praetorium. Let’s come back to this in a moment. The second thing that jumps out is a repeating phrase: King of the Jews, “Basileus ton Ioudaion,” in Greek. We find this phrase in verses 18:33 and 18:39. Inside these verses is a synonymous parallelism dealing with Jesus’ “kingship.” In line 37a, Pilate realizes that Jesus is a king: “So you are a king!” said Pilate to Jesus, to which Jesus answered in line 37b, “You say correctly that I am a king.” But He doesn’t stop there. Jesus reveals in this parallelism the purpose for which He was sent: “For this I have been born, and for this I have come into the world, to testify to the truth. Everyone who is of the truth hears My voice.” What we have formed here is a chiasm. Jesus has been sent to “bear witness to the truth.” And everyone who is of the truth “hears” Jesus’ voice. The word, hear, in Hebrew–the principal, spoken language of Jesus–is shama. To the Hebrew ear, to hear is to obey. All who are of the truth obey the voice of Jesus. The chiasm points to Jesus as a King who has come to rule–the essential meaning of the word gospel in Hebrew–He has been sent to this world to be obeyed. And what of the out-in-out pattern? The Jews are outside the Praetorium, the palace. And who’s inside? Their King, who has come to be obeyed. This is the portrait that John is painting with his words. In the chiasm, both Jesus and the disciples are “not of this world” (ek tou kosmou) in verse 16 standing in an antithetical parallelism to being sent “into the world” (eis ton kosmon) in verse 18. We see again an “out-in” imagery. Verses 17 and 19 form a synonymous parallelism–both Jesus and the disciples are to be “sanctified.” They are set aside in the “truth.” In Hebrew, again the language of Jesus, truth is emet, and emet is not a static idea or form of something or even something “not hidden” as in the Greek aletheia, but rather it is a dynamic force, something at work in shaping the world outside us, and forming the character within us. By being “set apart” in truth, Jesus and His disciples are agents of truth, living representatives of truth, sent into the world to shape it and conform it to the will of God. And to Pilate’s question, what is truth? Jesus makes it plain in verse 17–His Father’s word is truth. Truth is the Word of God. So now, equipped with these understandings, we circle back to the chiasm in John 20. Upon first glance, seeing verses 20:21 and 20:23 in parallel with each other is confounding. Yet, because our study of John 18 has revealed the reason Jesus was sent into the world–to bear witness to the truth–and because we know from John 17 that Jesus was “set apart” in the truth, that is, to be an agent of truth in the world, and because we know that truth is the Word of God, a dynamic force, shaping the world, forming the character of men, conforming the world to the will of God, we now know that Jesus, the King, has sent His disciples to do the same for “as the Father has sent Me, I also send you.” The disciples will be agents of truth, agents of the Word of God which is truth, shaping the world, forming character, conforming all to God’s will. How then is verse 21 parallel to 23? 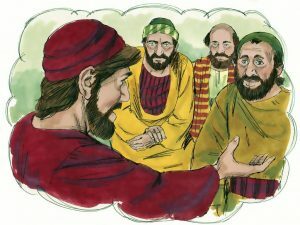 In 23, we see an example of the agency of the disciples. What is expressed in general terms in 21 is now made specific in 23; 23 amplifies 21; the two verses form a synthetic parallelism. The disciples are authorized by Jesus to forgive or retain sins–the authority to “loose,” that is in this case, “forgive” sin (allow the forgiveness of sin) and its converse, “bind,” that is in this case, “not forgive” sin (forbid the forgiveness of sin). The authority to bind and loose has been delegated by Jesus to His disciples. The author, John, has previously recorded Jesus stating: “Truly, truly, I say to you, the Son can do nothing of Himself, unless it is something He sees the Father doing; for whatever the Father does, these things the Son also does in like manner.” (John 5:19) As the Father does, so does Jesus. As Jesus does, so do the disciples. As the Father sent Jesus, so Jesus sends the disciples. This, in turn, points to the center of the chiasm in which Jesus breathed on His disciples and stated “receive the Holy Spirit.” In Hebrew, breathing and spirit are the same word, ruach. Jesus, who the disciples see as Lord, who is King, who is an agent of truth, an active agent of God’s Word, the Word of God itself, breathes upon His disciples, who then receive the Spirit of God. And the author, John, quotes Jesus as telling His disciples that this Spirit is the Spirit of Truth (John 14:16, 15:26) who will “teach you all things, and bring to remembrance all that I said to you.” (John 14:26) The Spirit is Itself an active agent and the means by which the disciples will operate as representatives of Jesus, enabling them to remember all that Jesus has taught them, becoming active agents of the Word of God, shaping the world, forming character, conforming the world to God’s will. Is John 20:21 a call to invite people to church? Probably not, but rather it’s a delegation of authority from Jesus to His disciples to bring truth, the Word of God, into the world, shaping that world such that it will be conformed to God’s will. The purpose of these last several lessons is to be careful not to pluck verses out of context, bending their meaning to conform to our own purpose, whether that be evangelism or anything else. This is a careful analysis of John 20:19-26 that is wholly based on the literary structure of the passage. Supporting texts are provided for clarificatory and amplificatory purposes. I find the chiasms quite compelling. The chiastic structure is clear enough to serve as handle to aid in the study of the passage. We should now begin a serious study of Scripture, ALLOWING IT TO SPEAK FOR ITSELF, that is, to uncover the structure that binds the words of the text together into a meaningful (explained) whole. As stated, the sending of the disciples is based upon the Father’s sending of His own Son into the world. Thus, as the Son was sent by the Father to bear witness to the truth- to be agents of change in the world, in conformity to God’s will – so now Jesus sends the disciples. Consequently, the use this text for “evangelistic purposes” is to emasculate the truth that it bears. I might add a few interesting facts. The Gospel of John begins with a preamble that declares: “In the beginning…” (Jn 1:1). This at once reminds us of the first words of the Torah, “In the beginning…” (Gen 1:1). God created man (Gen 2) by a “breath” into his nostrils (v7). 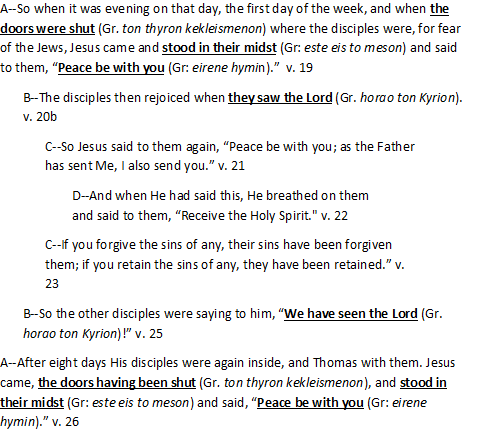 The LXX translation corresponds to the terminology of John: Jesus “breathed” on the disciples (20:22). In the Torah Adam came alive; in John, the disciples received new life: “Receive the Holy Spirit.” The verb “receive” in this text indicates it did happen. Second, John’s Gospel unfolds by describing the prophetic ministry of John (the baptizer). The author writes, “There was a man sent from God, whose name was John. This man came for a witness, to bear witness of the Light, that all through him might believe” (1:6,7). While John’s “witness” was important, it is not on par with the witness that Jesus was sent to the world to be and to do (5:31-40). Jesus insisted only the Father’s witness will do. What does this say about the Son’s relationship with His Father? Let that sink in. Finally, an interesting tidbit. In one of Richard’s paragraphs (which begins with the words “So now, equipped…”) is a sentence that comprises 114 words from start to finish! What a construction this is!